If you have children, and are a gamer, you have probably run into some awkward situations. There are some games that are perfectly acceptable for adults, and yet wildly inappropriate for children. Some parents may disagree, and buy Grand Theft Auto for their first grader, but for most of us, there's a line between what's a "me" game, and what's a "kid" game. This line varies from gamer family to gamer family, of course, and by child, as well. For my youngest, who is eight, we have a higher tolerance of sci-fi violence (such as that in Halo's campaigns) than we do human on human violence (Call of Duty comes to mind). Excessive realistic gore is a no-no (Left 4 Dead), but heavily stylized cartoon blood (Castle Crashers) is acceptable. For our older son, fifteen, all the above games are probably OK, but I'd draw the line at games with strong sexual content or excessive language. The point is, there are going to be some games on the shelf that your kids are not allowed to play. Alas, the forbidden fruit is often the most enticing. The very fact that a game is off limits just makes it more appealing to kids. 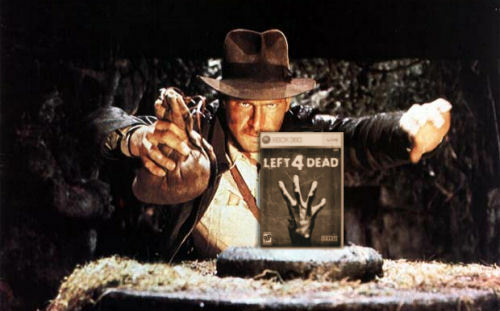 I find my son staring at game cases for Left 4 Dead, God of War, and other "daddy" games in a manner that can be likened to that of Indiana Jones and the golden idol. I wonder, what thoughts are going through his head? Does he wonder what gore is? Violence? Sexual themes? I certainly hope not. Perhaps he daydreams of skeletal archers and Boomer bile? Who knows. Let me tell you, my son is a good kid. He never gets in trouble at school, always does his chores on time, and is, generally speaking, a darling little angel. It's difficult to believe he could do anything sneaky, or devious, at all. But as he grows older, he has been resorting to acts of stealth and trickery to get a glimpse of these games. And so, we have begun a game of cat and mouse, each countering the other's moves. I fight for his continued innocence, he fights for blood, gore, and intense violence. Thus far, I'm ashamed to admit, he is winning. He has developed some tactics in this war that I've found difficult to counter.